In my last article I covered the "why" and some of the "how" of teaching inventing. This time I'd like to explore some more specific options and think about how they apply at different student skill levels. For the very young, storytelling is a great way to get them going. As you will have explained about high and low notes, loud and quiet, fast and slow, you already have the ingredients for some basic sound-effect inventing. Use their favourite story or get them to think of a scene (walking along the beach, taking a path through the forest, going on a theme park ride). what would the birds sound like? What sort of music would represent walking along? Now you are running - how does the music change? Who else is there and what do they sound like? Are people chatting, or maybe arguing? (need both hands for this!). You can also prompt with sounds yourself, or help them to build up a little bank of sounds before starting the story: [loud low notes] "here's a massive tree / there's a big ship out in the bay", [high scrabbling] "the leaves are rustling / the waves are sparkling". If you give them homework to invent a picture or tell a story with sound effects at the next lesson, they will be delighted to share it! Remember, if you give feedback on their efforts, keep it all light and full of appreciation. There is no such thing as "wrong" inventing, and if you give the impression of wanting to take over and improve on what they are creating, you are robbing them of ownership and creating an inhibition for next time. Fear of "getting it wrong" will stop creativity in its tracks and will also prevent them trying things at home. For older children, a more skill-based approach helps. They may well know what they want it to sound like, but lack the technique to make it happen. Encourage them to learn a few tricks to give them more confidence. It's a great incentive to practise scales and chords! This kind of work can tie in with learning concepts such as major and minor, or how to invert chords, or working with intervals. It also overlaps with playing by ear. You can try recycling an interesting fragment from a piece they already know, although sometimes this doesn't work because they find it hard to break free from the composer's existing use of it. As you will have a large stock of remembered music in your head, you can also adapt almost anything to get things started. How many ways can you play these (three, four, five..) notes? ...and so on. You may have to put these ideas into less theoretical language for your student, but try to avoid demonstrating unless they become completely stuck, because you want the ideas to be theirs, not yours. Even if they are stuck, sing or tap something to try to get them going, before resorting to touching the piano. Advanced students will either have done lots of this already and be well launched on their inventing, or they will have done far more work from notation and will quite possibly feel inadequate about trying to "improvise". It is a sad but inevitable fact that there is always somebody who is better than you and me at any given aspect of playing the piano, so if this is causing your student to balk at being disappointed by their own attempts, be reassuring: you have to start from where you are, and take the steps towards where you want to go. You need two players, or one player using two hands. First player chooses a note and plays it, sustaining it until it is their turn to move again. Second player mentally hears the note they want to "go" with it, and then plays that note. Now two notes are sounding together. First player thinks of/hears a new note and changes to that. (There are two notes sounding at all times until you finish). And this continues until players agree to stop! If a player plays a different note from what they intended, they must not correct it! "No wrong notes, only unexpected ones" is a motto for this game, and the other player has to cope with finding a sound to match the unexpected one. Once players are used to trading single notes, they can start to add passing notes or decorations but should always come to a stop on a target note and hold it while the other responds. Results can vary in this game. If players stick with nearby notes and aim for a tonal style, it can quickly start to sound like Renaissance counterpoint. On the other hand, a more adventurous approach can take you into other sound worlds... Only the player knows whether they really pre-heard the note they played, but if you suspect they are drifting off into lazy randomness, you can ask them to hum their note before finding it on the piano. I tend to end up singing along anyway when I do this game! Inventing is a very broad term.. Not all the ingredients of composed music need to be there, and if your student wants to improve in a systematic way, it is helpful to focus on the ingredients individually. Rhythm, for example - you could clap a short pattern and get them to invent an answering pattern, or you could set up a simple repeating pattern and they could clap cross-rhythms, syncopations, or anything that they feel "goes" with yours. Using established forms such as the twelve bar blues can provide material for a longer term inventing project - once they are fully comfortable with the order and spacing of the chords and can change fluently with both hands, they can start to work on melodic and rhythmic patterns. It takes time to build up the skills but many students find it very motivating. It is also a great way to improve their abilities with inverting chords and building tunes using chord notes and passing notes. As the twelve bar blues is such a well-known form, it is great for impromptu duetting or even jamming with friends on other instruments. And when there are more people playing (especially if there's a bass player) the pianist can be more adventurous - less is more, and putting in plenty of silences and repetitions can actually make them sound very skilled. For pianists, coordinating the two hands while inventing is a big challenge. This is true especially if one hand is repeating an ostinato (or something like a blues or boogie bass pattern) and the other is playing freely. There are a few ways to overcome this, apart from simply practising towards the more difficult skills. One is to remember that both hands don't have to play all the time - in fact it often sounds better if they alternate. Playing a melodic line over (or under) a sustained note or chord can sound very good. Using silence as a feature can also give the player a moment's respite. Inventing a finger exercise to tackle a new technical problem, extending a sequence discovered in a new piece, putting in extra ornaments in a Baroque binary repeat, trying out a chord progression and then humming a tune over it... 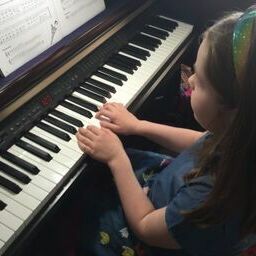 These and many more activities (including full blown composing, which takes us a bit too far from "useful piano" skills) are all part of the spectrum of "inventing" which unlike a rainbow, has no end.